Introduction/background: Chest radiographs have endured time as a mainstay imaging tool in the assessment of the thorax. The interpretation of frontal radiographs (PA and AP views) in perioperative patients is routine, and anesthesiologists become well versed at recognizing anatomy and pathology on these projections. They may have less experience in reviewing lateral radiographs. However, lateral views may clarify frontal view findings or provide new information, and can be particularly helpful in assessing the retrotracheal, retrocardiac, and retrosternal regions, as well as the hilar structures, fissures, pleura, and posterior lungs. This exhibit reviews normal anatomy and the interpretation of the lateral chest radiograph through cases that depict abnormal findings of potential importance to the management of perioperative patients. Methods: Chest radiographs from a teaching file were reviewed with an experienced chest radiologist. Cases were extracted that depict findings on lateral radiographs not conspicuous on frontal radiographs and of potential importance to perioperative management. Results: Teaching file review yielded 23 cases to date. Examples of cases selected from the file include the following: dilated esophagus recognized by posterior tracheal stripe thickening and an air-fluid level, aberrant right subclavian artery aneurysm presenting as an opacity posterior to the upper trachea in Raider’s (retrotracheal) triangle, mass effect on a main bronchus causing alteration of lateral view hilar anatomy, pulmonary artery enlargement suggestive of pulmonary hypertension, lobar collapse best seen on the lateral view, early pulmonary edema recognized by new thickening of major fissures on the lateral view, pleural pigtail catheter in the posterior chest wall on the lateral view, partial SVC obstruction presenting as a dilated azygous arch on the lateral view, abnormal course of a lead directed into the azygous arch on the lateral view. Discussion: A wide variety of thoracic abnormalities are located and shaped such that they are more conspicuous when the thorax is viewed from the side than front. It is important to review lateral radiographs when available in the medical record. This exhibit illustrates abnormalities on the lateral radiograph of potential importance to anesthesiologists. For example, in the case of the dilated esophagus and esophageal air-fluid level, the anesthesiologist may alter the anesthetic plan to protect the patient from aspiration of esophageal contents. Decompression of the esophagus or rapid sequence induction may not have otherwise been considered. A right subclavian artery aneurysm may deter the anesthesiologist from ipsilateral central venous line placement or supraclavicular brachial plexus blockade. Each of the lateral chest radiographs displayed and reviewed will illustrate anatomy and the significant impact that findings on a lateral view can have on anesthetic management. This oft overlooked view has the potential to improve the safety of the anesthetic plan. 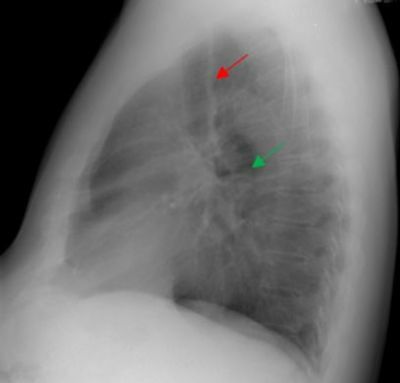 Figure 1: Dilated esophagus with air fluid level (green arrow) and thickened posterior tracheal stripe (red arrow). Figure 2: Left pulmonary artery enlargement (red arrow) in pulmonary hypertension.